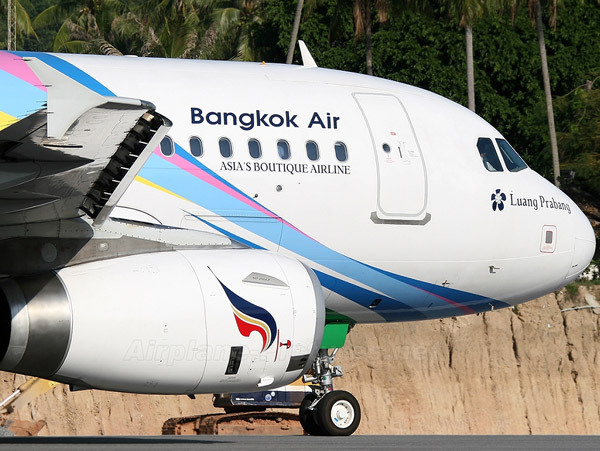 Until Koh Phangan Airport opens the quickest way to get to Thong Nai Pan from Bangkok is to catch a Bangkok Airways flight to Koh Samui and then catch a ferry from Big Buddha (Haad Rin Queen), Maenam (Lomprayah and Thong Nai Pan Express) or Bang Rak (Seatran) to Koh Phangan. The flight takes just over an hour and the boat journey about 30 minutes. You can set off from Bangkok early morning and be on the beach for lunch. Unlike many other domestic carriers, Bangkok Airways still uses Suvarnabhumi Airport. Although it is farther from the centre than the old Don Meung AIrport there is now a convenient and cheap train link to Suvarnabhumi. This saves 500 Thai Baht on a taxi. The only problem with the Suvarnabhumi - Koh Samui route is that Bangkok Airways is comparatively expensive. They do little to justify their self-styled 'boutique' image except charge between 1,000 and 2,000 Thai Baht more than other airlines such as Air Asia and Nok Air. Unfortunately, these cheaper alternatives are on the mainland - the boat journey from Chumporn or Suratthani extends the journey time by 2 or more hours. Other airlines can now use Koh Samui Airport so it is always worth researching other carriers for flights to Koh Samui, especially if you are not coming from Bangkok. The timetable above is Bangkok Airways Winter 2016 Schedule. We are currently on the 'Winter Schedule'. The above information is valid to March 26th 2016. The schedule updates usually add or remove a few flights but basically the schedule remains the same - namely a flight every hour from 0600 to 2200. For December, the peak season, there are sometimes flights every 15 minutes. Despite the large number of flights available it is a good idea to book in advance at busy times of the year. It is also worth looking at different days and times as you can save yourself 1,000 Thai Baht on promotional offers. The airport building in Koh Samui is only a few years old. 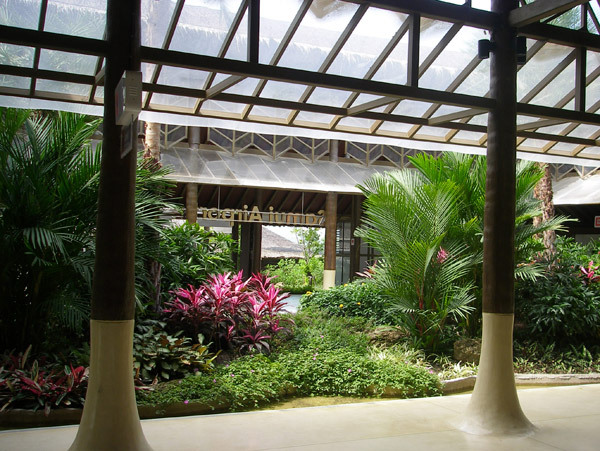 It is a stylish building set in tropical gardens. 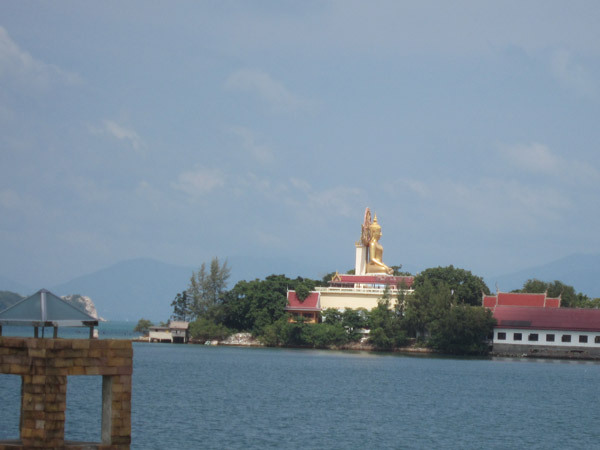 The nearest pier is Big Buddha. It takes about 20 minutes to get from Big Buddha to the airport by taxi. The Haad Rin Queen goes from Haad Rin to Big Buddha pier. The next closest is the Lomprayah service from Bophut (Koh Samui) to Thongsala (Koh Phangan). Koh Samui taxis, like Bangkok taxis, are yellow with a sign on the roof saying "meter". However, the drivers refuse to go on the meter despite an effort by Koh Samui authorities to fine taxis that refuse to give metered fares. Negotiate a price before you get in the taxi. The advantage of the Lomprayah ferry service is that the ticket price includes a transfer to anywhere on the island. In Koh Samui Airport there is a shared mini bus service available. You can also pay for fixed price taxis. Cheaper flight alternatives are provided by Nok Air, Solar Air and Air Asia. These all take longer than Bangkok Airways because you have to fly to the mainland. When Koh Phangan Airport is built Bangkok Airways will no longer be the quickest option for travelling to Koh Phangan. Whether competition will lead to price reductions on the Samui - Bangkok route is hard to tell.